Following on from the successful RHEL8 on a ThinkPad P1 installation I thought I would revisit my Fedora install. The Fedora 29 installation wasn’t quite as smooth as the RHEL 8 install. Here are some notes from the various BIOS and boot combinations I used with the Fedora 29 Live USB. Gets past “Starting GNOME Display Manager” but left with a flashing cursor on the top left hand corner of the screen. Boots OK, all 12 CPUs visible. However, cursor becomes erratic to respond after several minutes of uptime. The behaviour is similar to the one described in comment 20 of Bugzilla 1573080 kernel-4.16 doesn’t boot on Lenovo P50 although I admit I did not check ‘top’ to confirm CPU usage. Neither of these options are ideal. For my latest installation, I thought I would try option 1 and then apply the latest kernel update. At that point we can then see whether we can remove the acpi=off flag, switch to Discrete Graphics or try the NVIDIA drivers. The Fedora 29 kernel shipped with 4.18.16-300 but a ‘dnf update’ at the time of writing brought this to 4.19.4-300.
boot the installed operating system and remove the ‘quiet rhgb acpi=off’ boot options. This booted to the login screen, accepted my credentials but then gave me a blank screen. I wanted to keep BIOS settings to ‘hybrid graphics’ so that the integrated GPU can be used when I boot back into Windows, so I decided to reboot (with the ‘quiet rhgb acpi=off‘ flags) and install the NVIDIA drivers in Fedora. Launching ‘Software’ in Gnome for the first time should prompt you to confirm whether you want to enable Fedora Third Party Software Repositories. In the event that this doesn’t appear you can install the following RPM which adds some repositories in /etc/yum.repos.d. 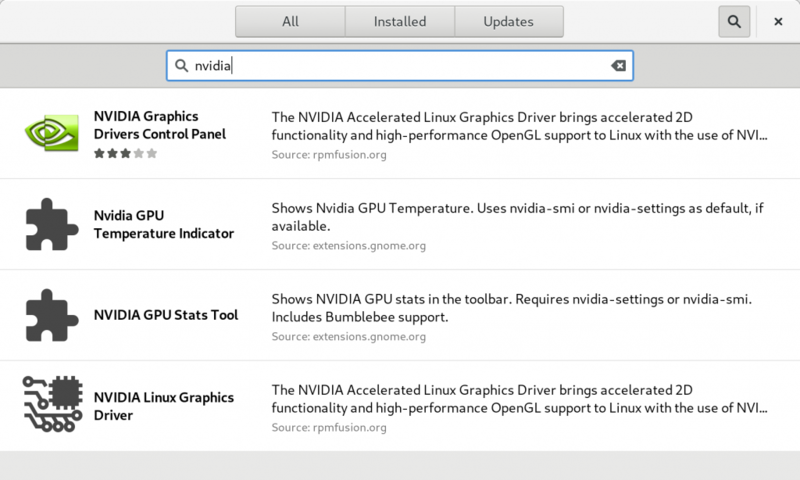 Search for ‘nvidia’ in the software window and the ‘NVIDIA Linux Graphics Driver’ should be listed. I proceeded to reboot the laptop – first with the ‘acpi=off rhgb quiet‘ options and then without them. Both options allowed me to boot into the graphical desktop and removing the acpi=off flag allows all the CPUs to become visible and the power management functionality works correctly – battery levels, brightness levels with the function keys, etc. GRUB_CMDLINE_LINUX="rd.driver.blacklist=nouveau modprobe.blacklist=nouveau nvidia-drm.modeset=1 resume=UUID=a8b47a6f-1223-42aa-8b73-5c922cee1901 acpi=off rhgb quiet"
Verify /boot/efi/EFI/fedora/grub.cfg is as expected and optionally reboot. Note that I chose to remove the rhgb and quiet options from the boot loader. This generates extra message on the console but these can sometimes be useful. The kernel modules with the NVIDIA driver must be rebuilt with each kernel update. Using the NVIDIA packages from the RPM Fusion repository we installed from the Gnome Software Application takes care of this for us. Important: after the dnf command completes it will take a short time (less than a minute) to compile the module. Do not reboot until this process completes. The above is a good option if the ThinkPad is mainly used at a desk with a plugged in power supply. This should extend the life of the battery. The drawback is that if you need to charge the battery to 100% so you can work without the power supply, you’ll have to stop the TLP service or alter the settings. 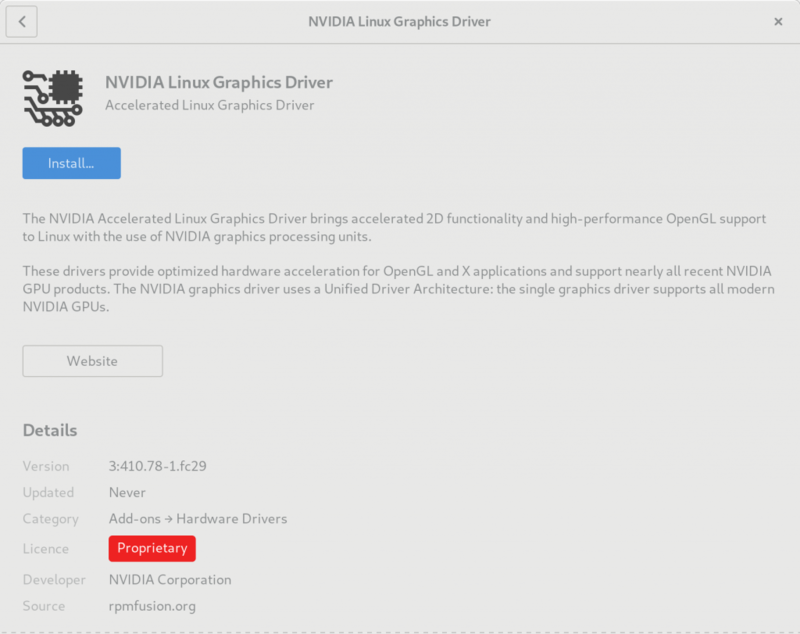 With a few tweaks, Fedora 29 is running on the ThinkPad P1 using the NVIDIA Graphics driver and with ‘hybrid’ options selected in the BIOS. TLP settings are working fine. Good post, didn’t know about tlp. I have ThinkPad P1 running Fedora 29 for almost a month. All looks good. At the momembt of writing this battery KDE Widget says it will last for 8:43 (96%), but I guess that is a bit too optimistic. – Connecting / Disconnecting external monitor. The only way I managed to connect external monitor was to setup bumblebee and launch “intel-virtual-outputs -b” after connecting external monitor. That turns bumblebee on, which powerup Nvidia card. You need that because HDMI port is wired to Nvidia card. I use external monitor as a main monitor and I have to readjust xrandr settings every time I connect monitor (I use KDE Systems Settings for that). If I disconnect external monitor while desktop is extended when KDE freezes and I have to kquitapp5 plasmashell && kstart5 plasmashell to get it back. The proper way to disconnect is to press Fn+F7, choose screen mirroring and then disconnect monitor. To save battery you need to kill intel-virtual-outputs to turn off Nvidia card. It would be nice to have a automation for that – run the script then monitor is connected and disconnected. Screen tearing is annoying. Even browser scrolling is affected by that, not speaking about video playback on external montior. Looked all around, but none of the suggested settings helped (VSync in nvidia-settings, environement variables setting in profile). Then working with power cord plugged in Fans go too loud sometimes. I tried to use thinkfan and fancontrol services to adjust temperatures and fan speeds to something not that annoying, but did not come to a anything which let me forget about fans. it is interesting that this laptop has 2 fans, but you can control only one. The other (on the left hand side) can’t be controlled. Working on battery fans are quiet, no complains. I guess that temperatures goes a bit higher with power cable connected because usually I work with external monitor which requires Nvidia card to be on. One more thing is strange electrical noise comming from laptop. When you work in really quiet environment you can always hear some kind of noise coming from laptop. It is difficult explain what kind of noise is that, but it is something similar you can hear being under high voltage wires. Thank you! My wife’s P1 happily runs Fedora 29 now! thanks for this! was the last piece of the puzzle for me.